I could have posted no end of photos for a blip today, but I have restricted myself to just two extras. On a local privately-owned estate nearby, there is a place called ‘Natural Surroundings’. It has a café and shop with very tasty home-made cakes and a plant centre that sells cottage garden favourites, native wild flowers, also a few unusual perennials, (I shall be visiting them when I’m ready to populate the new woodland area in my garden). 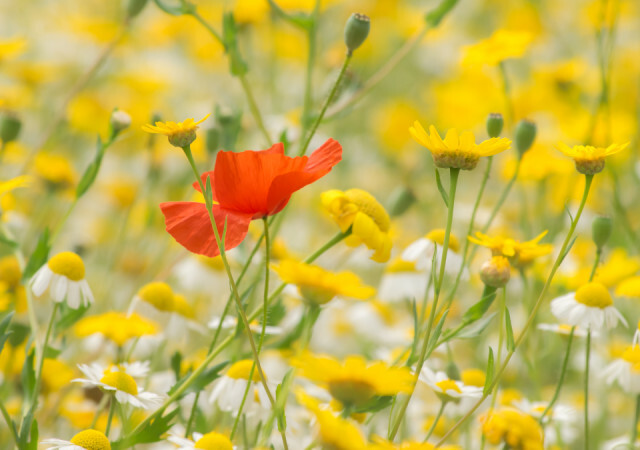 All the plants are chosen to be wildlife-friendly and should attract bees, butterflies and bats, which is just what we want to do. 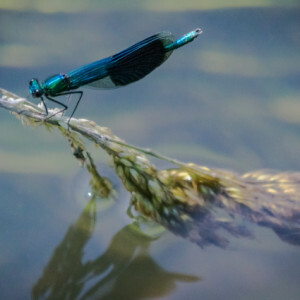 The site also has a nature reserve and gardens, also pond dipping for young visitors. They breed harvest mice for release into their reserve, which can be viewed in one of their buildings and are cute and fun to watch. This beautiful site is set in mature woodland on the side of the Glaven valley and is bordered by the River that gives the valley its name. So, as you can imagine, it’s the perfect place to go for a wander round and chill, out on the reserve or enjoy having a chat with friends in the garden, accompanied by some refreshment, naturally. This is exactly what B, A and I did, it was way too hot to walk a huge distance so we had a wander with cameras and enjoyed all the beautiful wild flowers and butterflies, then finished off with locally made salted-caramel ice cream under the shade of an umbrella on their pretty terrace. My main blip was taken in the wild-flower area with an extra of a banded demoiselle. 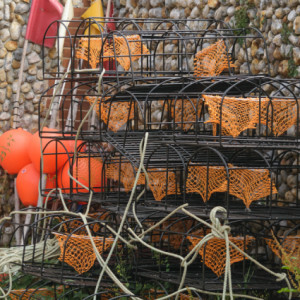 In complete contrast…and on a rather flippant note, the last extra is of some lobster/crab pots (not quite sure which), where the string part of the pots bear a remarkable resemblance to orange pants!